This is my second stay at HI San Diego, Point Loma. I LOVE THIS PLACE. Staff, location, vibe, excellent. Everyone is super friendly and so, so clean. Shout out to the neighborhood restaurant/bar on Voltaire, Royale, for treating this guest like part of the community. I will be back for another wonderful stay ASAP. Most excellent place to stay! I absolutely recommend! Plenty of street parking. Wonderful atmosphere, I feel at home there. People are very considerate. I'd stay there every time. I absolutely loved this cosy hostel! It felt like home as soon as I arrived, the kitchen is well-equipped, there is a beautiful outdoor patio, the staff are friendly and the room was super cosy with great mattresses. It was exactly what I was looking for - friendly guests of all ages but not a party hostel. I would definitely stay here again. Great place to meet new people and friendly staff. Very well designed facility, nice colors and furniture, kitchen facilities. Room very nice a clean. Staff very helpful. This place is awesome! Amazing Hostel! Has wooden beds, every bed has a plug, a light and a big locker (with also plugs in it). Staff is extremely friendly. Very clean at all time. Breakfast is really good, they have a lot to offer. Near to a bus stopp, to a supermarket and different places to eat. Atmosphere is really good, a lot of places to hangout and meet people while at the same time being very cozy. Washing and drying possible for just 1.25$. Would definitely recommend. The lady that checked us in was very nice. Entire hostel was very clean and the beds were super comfortable. Had a private room, first time with a private room in a hostel that had bunk beds instead of a double bed though. Location was great and would absolutely recommend. I wasn't able to spend much time at the hostel but I did really like it for a variety reasons... The staff were very friendly and helpful, the lockers would generously large, the kitchen was spacious and had lots of great tools and equipment. The place was clean and well-maintained. 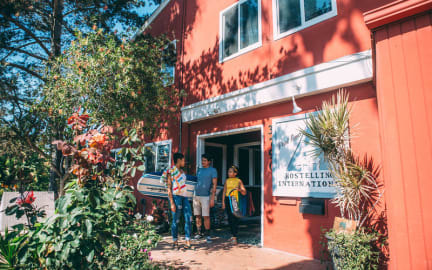 Overall, I really liked staying at the Point Loma hostel.